Brandon Boyd is a Chairman of iMarketsLive. He makes a lot of videos to help you with different aspects and with the network part of IML. He believes that are things to do and not to do on the way to success. From one of his videos, I made a summary of his keys to success. I hear you, you do not like to read books. Well, leaders are readers! Nowadays there are audio books available. Instead of reading you can listen to a book being read to you. What type of books should you read? Well, books on persuasion and influence. You need the ability to persuade people to take action, to live a better life. You need to persuade people to take better decisions for their lives. When you read different books, you read about different styles to do things. Choose the one that suits you best, model the way, adapt it to your personal style and circumstances. The idea is not to be a copy cat, but to be authentic. Study the great communicators, like Les Brown, Tony Robins, and Zig Ziglar. It is key in network marketing. The better you get in communicating, the better your chances are to get success. Brandon says that without goals, no great thing will ever be achieved. Have you set your goals for this year? It is good to have your goals next to you all the time. It would not be a bad idea to print them, laminate them and put them somewhere you can see them often. Goals help you to remember why you are doing the things you do every single day. Set the goals in front of you, not just set them in your mind. In your mind, you have a big chance to forget about them. Look at your goals several times a day. Sometimes you have to modify your goals. It is possible to achieve your goals before the date you expected. For instance, you reached a certain rank this month instead of 3 months plan. Now you can set a bigger goal because you know it is possible! “You have to decide that you want to lead. You have to step forward. That means not being like everyone else.” These are the words of Mr. Boyd. But he is not the only one who says that. When you read books about finance, self-help, leadership, etc. you will see this expression all the time. Leaders are different from other people. One of those things is leadership. Most of the time you start out as a follower but at some point, you have to make the decision to be a leader. A leader is a person that can influence others. When others are watching tv, smoking, drinking, or playing games and so forth, you are doing something different. The practices just mentioned are not the practices of people that win! You lead! You step out. People that are successful for decades, not just for some months or a year, they do not play video games. Maybe you know someone who is successful and doing those practices. Probably they can do those now that they are successful. On the way to success, those practices will only stand in the way. Self-confidence is the process of keeping promises you made to yourself. Probably you will not see this in the dictionary. Self-confidence is for example: getting up at a certain time every single day, following through on what you said you would do, etc. When you do this it will build confidence in you. Confidence comes from pursuit, it comes from success after going through the mud in life. Everybody goes through it. The more that you pursuit, the more that you see happening, the more confident you will become. Confidence does not happen overnight. It is a process, it grows with your experience, by doing it over and over again. You will also be more confident when you hang around the right people. It will boost your confidence. If you are hanging out with people that are going in the direction that you desire, guess what, it will help you to see the possibilities, it will boost your confidence. Nothing great occurs without massive, consistent, focused action. To a lot of people, an action is a curse word. Things should come to them. But if you have this year a different year than last year it is going to take consistent, massive action. Whether you want the change in fitness, business, relationships, it is going to take massive action to bring on the desired change. Brandon, for example, takes massive action on his marriage. He takes time to spend with his wife, communicating with her, giving her words of affirmation, spending quality time with her, physically touch her, etc. So he has a good marriage. Whatever you decide to do, take massive action and good things happen. If you focus on something hard enough and long enough, it will become fruit in your life. It needs laser focus over a period. Some people go to a convention, love it, try one or two things out for hardly a week, and then tell you that it doesn’t work. So it is not only massive action, it is consistent massive action. Small thoughts equal small results. You can’t have a Rolls Royce when you plant a Honda Accord. Some can say that this is offensive. Maybe you have a Honda Accord. It is a nice car and there is nothing wrong with it or you. This example is taken by Brandon Boyd to show the difference in car class. It could be any other car. The point is that if you want to have a huge future, there are certain things that you need to plan in order to have that huge future. So get around what it is you want. Is it a car, a house or a person? Whether it is a material thing or a spiritual thing, define what it is and who you want to become. And make it big. Read books to help you with this. The first book Brandon read about this was “The Magic of Thinking Big”. He read it when he was in college. Today you can even listen to it on audio. That book changed his thinking. He went from wanting to make a hundred grand a year to a hundred grand a month!! And guess what? It happened. But Brandon thinks that this would not have happened if he didn’t read the book or surrounded himself with the people that thought the same way. You cannot afford to spend time with those who are negative; those who are not in support of what you are trying to do. One of the goals Brandon has is that if you are going to call or contact him with negative information he is going to ask you to go away. Sometimes in business, you have to deal with some negative things, but that is different from complaining. Some people are really energy vampires. The number 1 contributing factor to success is who you choose to associate with! Take this info and apply it to your life. Do you think it will change things around? I know it will. Be blessed and make a difference in your life!! Author MMacLeodPosted on January 21, 2019 January 21, 2019 Categories UncategorizedLeave a comment on Brandon Boyd’s Keys to Success! Maintaining your personal, professional and business life online has become a daunting task. Too many choices have created too much confusion, while none seems to give you the control over your communication that you desire. WebTalk is the first all in one communication, collaboration, and commerce networking community. Build to help you communicate better and save time. With WebTalk you will strengthen relationships with more targeted and visible communication, build your credibility and conduct your business more efficiently through a cloud-based hub that brilliantly organizes your personal, professional and business life into easy to manage categories. Do you think WebTalk is for you? WebTalk puts you in control over who sees what and when. The social awkwardness of adding colleagues, friends, and family to the same online network, is now over. Managing your communication better begins with managing your contacts better. WebTalk’s patent binding connection process helps you label your connections based on real-life relationships. When building new relationships on WebTalk, you can label business connections as a prospective contact for sales, employment or business investment opportunities. Using WebTalk’s build in group and subgroup labeling feature. Then add keywords and descriptions that help search for that person later in your contacts management directory. With build-in professional, personal and public networks WebTalk helps you manage your online life as you would in real life. Building and maintaining credibility is extremely important in all aspects of your life. That is why WebTalk allows you to showcase your talent through their virtual resume and media gallery to show off your professional portfolio, degrees, certifications, photos and videos. Business can also showcase their products, ratings, and reviews on the business page. Helps to build trust and attract new customers. In the near future, WebTalk will offer a marketplace search feature to help all users find products offered by other members and conduct more business locally. WebTalk wants to help everyone connect to more opportunities and become more successful. That’s why WebTalk pays out up to 50% of all revenue through an immensely lucrative referral program called Social CPX. WebTalk’s largest online networking and e-commerce competitors generate tens of billions of dollars every year from advertising, premium upgrades and transaction fees. Facebook and Linkedin on average generate $3,- per month from every user and Amazon generates $70 per month per user from product sales. As the first social e-commerce community, WebTalk projects reaching an average of $10 per month from every user. WebTalk generates income from Advertising sales, Premium feature upgrades, Talent solutions, and Transaction Fees. Just like the others. But the difference is, we share it with you. When you enroll in their free affiliate program you earn a 10% commission on all revenue generated by the users and business’s you referred to WebTalk for life. Your long time earning potential per user referral is estimated at $1 per user per month. We all know that $1 is not life changing so WebTalk decided to do the unimaginable. It will reward credit for starting a chain reaction of referrals. With WebTalk you will earn $1 for your direct referrals but also their referrals and their referrals. And so on, through 5 degrees of separation. Let’s say the average monthly commission per referral reaches $1. And you and all your referrals have 10 referrals each. And that this continues through all 5 degrees or levels of separation. You can earn $10 per month from your first level; $100 from your second; $1000 from your third; $10000 from your fourth and $100000 per month from your fifth level. With WebTalk’s affiliate program a simple follow me WebTalk on FaceBook or Twitter could be potentially life-changing. The best part of the affiliate program is that you do not have to change anything about your daily routines. Every Social Network gives you a profile or page link for you to share and build your network. WebTalk does the same only better. When your profile link drives new users to WebTalk, the patent-pending affiliate program gives you credit for the referral. Import your email or phone address books to invite your contacts to connect with you on WebTalk. And you will get credit for everyone that joins. Share your photo’s, videos and files with none members and you earn credit when they sign up to view them. If you own a website or blog, WebTalk provides you with social buttons and banner ads to display to your site visitors. And if these tools drive new users and you will earn for those referrals as well. It is that simple. Social CPX is WebTalk standalone referral program app that provides you with a mobile dashboard that tracks all of your referrals from any of your social activities. You can view how many invitations you sent, how many people joined WebTalk thanks to you. The amount of revenue generated and your commissions. WebTalk and its affiliate program are free and always will be. The people and business that join WebTalk early and help to grow the community will have the largest income opportunity. Today there are 2 billion social network users worldwide with that number projected to double in the next 5 years. The more people you invite to WebTalk now, the better your chances are for a life-changing success. You have nothing to lose and everything to gain. Join now and invite everybody you know before they invite you. Is WebTalk for you? I think so. WebTalk is the best free way to communicate and create success. or take a view of my profile on WebTalk. Author MMacLeodPosted on November 26, 2018 November 26, 2018 Categories Tips2 Comments on Is WebTalk for you? I was a complete newbie when I came to the first task of creating an account on social media and posting. Wealthy Affiliate is teaching me a lot how to post and all of the things related to that. When my daughter saw my posts she told me to use hashtags. Hash what? I didn’t know what she meant. She told me that if I didn’t use them, nobody would see my posts. I was like, I posted it so they will see it. Nopes was her answer. Well, the second one gave me more to go on. The third was about the use of hashtags. I looked at my daughter’s posts and saw the hashtags. I had seen them before in posts, but I thought it was just a thing young people did. I didn’t know it had a purpose. The purpose is to attract people to your post by using keywords about your content and related to it. You must imagine that people looking for information/pictures/content on a specific topic will type in a hashtag to get the most relevant posts for them. We want to be part of what they find, we want the traffic! So the use of hashtags is important if you want your posts to be seen. There was my daughter again. I was not using them right. The way I used them, in the caption, made it not fine to read. And I had to put all words together, not using a space between words that belong together. Her recommendation was to use only one or two in the caption, but at the end, I could use as much as I wanted. The limit for Instagram is 30! Ok, I had to do something else then. After that, my posts looked more like this and they had a better engagement. Now I go to my twitter account and I look at the left-hand side and I see which hashtags are trending and if they can be matched with my content I use them. Like I did October 1st. I do not post without hashtags. I love them and they help me to get traffic, impressions, clicks and all the things we bloggers love. Some people say not to use too much, only 3 or 4. I use as much as I can as long as they are relevant to the content I posted. Tell me about your experience with the use of hashtags. I have some awesome possibilities for people to start an online business. I also have opportunities to learn to earn. All my friends tell me that the opportunities are great, but they do not have the money to start. Sometimes it is fear that is holding them back. But sometimes it is the huge debt they have. They really can not afford anything else. What can they do? Where to get help to get out of debt? Robert Kiyosaki is today one of the richest men on earth, but he once had debts too. His experience led him to make a list to help for getting out of debt. What are all those things, good and bad debt, …? I will go through some things that are important to help someone to get out of debt. When you are really in financial trouble, bankruptcy is always an option. For some people it is a viable alternative. It is still possible to obtain credit in some countries even if you do have a bankruptcy and/or a foreclosure on your record, This however will be different in different countries. I grew up hearing that it is good to have a debt so will pay less in taxes. This is true, but you will have less every month too. They forgot to explain the part of good debt and bad debt. Let’s take an example. I buy a house and live in it and pay my mortgage every month. This mortgage is a bad debt, because I am paying for. Buying that same house but renting it out, will make the mortgage a good debt. The tenant will pay rent and the rent will cover mortgage and expenses. Got it? A good debt is a debt on which someone else makes your payments. A bad debt is a debt you pay for. In the financial world they call good debt often leverage. If you have developed a high financial intelligence, you will know that having good debt is something you want. When someone else is paying for your debt, you will become rich. So from now on when you hear people simply say, ‘Get out of debt”, you know better and now it really means “Get out of bad debt”. Most banks will lend you money to buy a house or a building, but they will not lend you money to buy stocks or so. Why? Because stocks are riskier than a building. This does not mean that you should have a lot of good debt. The economy moves as waves up and down. Sometimes a good debt can change to a bad change. So be careful. If you have a problem managing your personal finances, please do not get any more debt, good or bad. It is important that you have your finances in order before you can become a successful investor. As soon as it is possible: buy real estate. In my case just getting out from under bad debt is enough to make my financial situation sunnier even without investing. Tell yourself exactly how your situation is. Don’t tell yourself and others that you have everything under control. Write all your expenses down. But most of all write your debts and the people and institutions you own money down. Who are the people (family and friends included) and institutions that you do owe money? Write them all down. There are a lot of possible debts. Think about credit cards, school loans, car loans, boat loans, IOUs, store credit accounts, home shopping and online balances due, vacation home, and your personal residence. These are all bad debts. Do not include your good debt, meaning debts for rental properties and business investments. Do not take another loan. Anything you purchase you pay immediately or by the end of the month. Don’t use your credit cards anymore. When you do this you will realize how many times you buy something just for the sake of buying, without really needing it. You will also realize that probably you are living above your means. You need to think about the bad debts, but also about the future. Robert Kiyosaki has a strategy he calls the “three piggy banks”. This is so simple and yet so powerful. I am using this and I am feeling so good about it. Set up three piggy banks: one for savings, one for tithing or charity and one for investing. Any money that comes into your house is not to be used fully to pay debts and to buy things. From every dollar that comes in, put 10% in each of the piggy banks for a total of 30% of all your income. For example, you earned $100, put $10 for savings, $10 for charity and $10 for investing. Keep doing this over and over and when you are getting financially stronger you increase your %. With time you will be living from only 30% and be putting 70% in your piggy banks. That would be awesome. Decide what percentage of your income will go into each bank each month. Hold yourself accountable to “pay yourself first” with every dollar that comes into your home. I can hear you asking “Why should I hire a bookkeeper when I have little-to-no money?” Well, a bookkeeper keeps you focused and forces you to face truth every month over and over again. Bookkeepers keep accurate records, can be of great emotional support when dealing with your financial situation and all rich people have bookkeepers. Sometimes you owe an individual money with no minimum monthly payment. Here you are going to decide what that amount is going to be. When you are ready with this exercise (for all your debts) you will have something like this. To determine the order, we are going to look only at the numbers that are circled. Which debt is number 1? 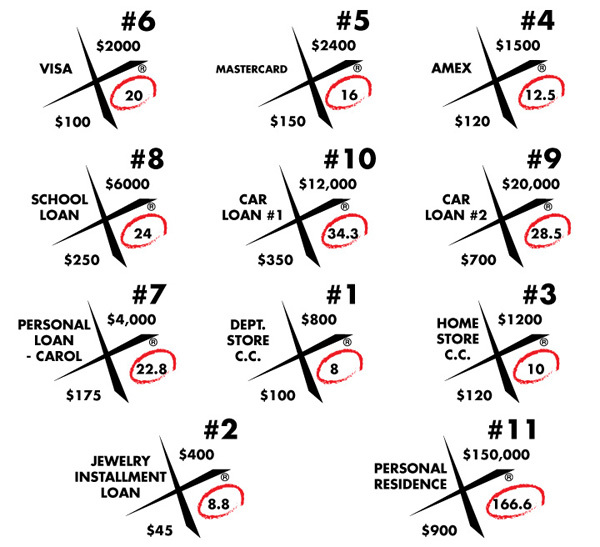 Number 1 is the debt with the lowest number that is circled. Write number 1 next to the quadrant. Find now number 2. This is the one with the next lowest number. And so on. Do this until all debts have a number. Now you have your ordered list for paying your debts off. Doing it this way you will soon see results and this will encourage you to keep going until you are done. “Where am I going to find an extra $100 to $200 a month?” will probably be your thoughts. But realize that if you cannot find a way to have an additional $100 each month, your situation is really really …… It will be nearly impossible to achieve financial freedom. But you can find a way. One that is legal and ethical. Can you bake cakes? Can you tutor a child? Something with your hobby? Affiliate Marketing? Wealthy Affiliate? Maybe work some extra hours? Try it, you will be surprised. It is easier than you think. Having said that, there’s nothing stopping you from creating more than $200 per month either. The strategy mentioned here will work only if you pay the minimum payment due on each debt and only pay $100 to $200 more towards debt #1. You are only paying extra on debt number 1. Keep on doing this each month until debt number 1 is completely paid off. 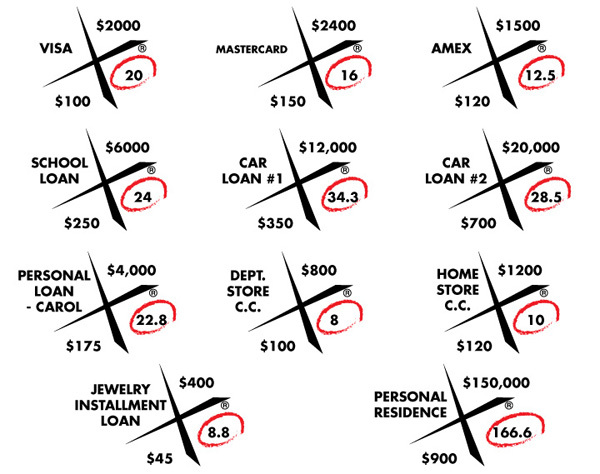 Go to the chart of debt number 1 and place a big red “X” through debt number 1. The first obstacle is taken. Congrats! Up to debt number 2. Here we are going to do the same as before: pay only the minimum monthly payment required for all other debts. For debt number 2 pay the minimum payment required PLUS the full amount you were paying on debt #1. 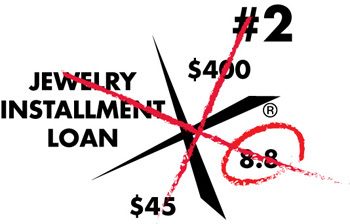 The minimum monthly payment required on debt #2. 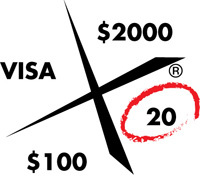 The additional $100 to $200 per month. This way you will be accelerating your payments on each debt you tackle. Continue to do this each month until debt number 2 is paid off. 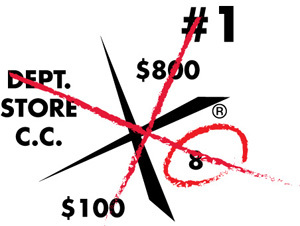 Then put a red “X” through debt #2 — and celebrate! The minimum monthly payment required on debt number 3. Continue each month until debt number 3 is paid off. 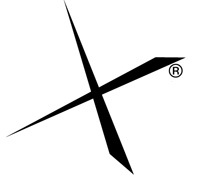 Put a red “X” through debt number 3. If you use this strategy you will not believe how fast you can become debt free. Some people will be free in 3 years others in 5 to 7 years. This is an ongoing process. Once you are debt free, you will use the amount you were paying monthly on your last debt to invest! Not only once, but each month over and over again. This amount will be substantial because of the accumulation over the different debts. You will be really surprised how much money you will have available to build the life you have always dreamed of. A life with no money issues anymore! YES!! This will put you on the road from debt-free to becoming rich!! MoreNiche Review – Would I join? MoreNiche is what I call an Affiliate Network. An Affiliate Network makes is a one-shop for Affiliate Marketers. Normally an affiliate marketer has to look for companies that have affiliate programs. An Affiliate Network has done this for you. So MoreNiche gives you a lot of companies that have affiliate programs. You just become a member of MoreNiche and they make a lot of companies with affiliate programs available to you. MoreNiche specializes in companies related to the health business. MoreNiche handles the financial site too. You do not need to collect from individual companies. So a real One Affiliate Shop. Affiliate marketers with a health, slimming niche. Of course, other affiliate marketers can offer these products too. “To transform as many lives as possible by helping people achieve their aspirations of health and wealth. The training of MoreNiche is readily available on their website. You do not really need to be a member to gain access to the training of MoreNiche. At first glance, you have to know what you need and there are some documents to help you out. I do not think it is very helpful for people who are completely new to Affiliate Marketing. They offer support by mail, chat, and FAQ. Their top affiliates will help you out. MoreNiche is totally free. Their training is available even without signing up. When you sign up you will get a dashboard so can track how your ads are converting. I think that it is a good affiliate network choice for affiliate marketers that are in the health niche. If you are a newbie it is better to look for affiliate training before joining MoreNiche. When searching around you will find some people saying that they are not paid out. But the majority says that they are paid out every two weeks as MoreNiche promises. If I had a niche in the health niche I would have given it a try. Author MMacLeodPosted on June 10, 2018 June 10, 2018 Categories ReviewsLeave a comment on MoreNiche Review – Would I join? Jaaxy is a tool to help you find keywords, track your website results and rank in search engines. You can even use this tool to spy on your competition and have so you can have a real competitive advantage over website owners in the industry. Here keyword is the most important word. Why would you need a tool for keyword? Is keyword a thing you should be interesting in. Yes, definitely so if you want to drive traffic to your website. And let’s be real, you have a website to share info with others. Those others are your traffic. In another post I will be writing about traffic and the use of keywords. #1: Jaaxy saves you an incredible amount of time while doing your keyword research. But Jaaxy is also very good to use as a keyword research tool. The alphabet soup techniek is embedded in it. The keyword management platform allow you to save, store, share, export and manage all of your keyword research activities. This will help you create better content posts. But even if you are looking for a niche you can use this tool. If you are an affiliate marketer you want to know which affiliate programs there are out there that you can use for your niche. Jaaxy can help you with that too. Do you need to know if a domain name is available? Jaaxy can help you with that. It will tell you which .com, .org and .net domains are available for any given keyword. As I mentioned in the good & bad seccion, there is no tab for training. The owners of Jaaxy are the same owners of Wealthy Affiliate. Being a member you will learn how to use the Jaaxy. The use of Jaaxy is simple and straightforward and ofcourse there are video’s on YouTube to help you out. There is a help tab, but there is not much there. There are 4 videos that are enough to put you on track and also some bonussses. See seccion Tools & Training. Jaaxy has 3 options for pricing. Click here to see what each option offers you. Jaaxy is my keyword research tool. It helps me a lot to give direction to my writing. This year I have published 33 articles. Only 7 are not indexed in google, but they are indexed in Yahoo and/or Bing. I have to mention that 3 of the 7 articles were news article where I didn’t use specific keywords. For me there is no better keyword research tool. I love it. In combination with Wealthy Affiliate it is a super combination. Do you want to give it a try? Find keywords here. Wealthy Affiliate is owned by Kyle and Carson. They work with a team and all of them has their specific role. In both the Certification course and the Affiliate Bootcamp you will follow courses hearing the voice of Kyle. But they are not the only ones you learn from. There is a Wealthy Affiliate Community. This community is formed by all the members of Wealthy Affiliate. The members are from countries all over the world. I have a feeling that most members are from the USA. But I have “met” members from different countries of Africa, like South Africa, Namibia, and Kenya. But I also have friends from Australia, India, Malaysia, Vietnam, and Russia. Of course, there are also people from Europe (for example from Finland, the Netherlands, France, England, Germany, and Greece). Hay muchos miembros que hablan Espanol y que son de Latino America. And do not forget my own region, the most fabulous part of the world, the Caribbean! How does the Wealthy Affiliate Community works? The members are people from all over the world. The cultural difference is enormous. But also the age difference. The youngest one I met was 17. I also met people over 70! Some are looking for a way to pay for college, others are looking for a way to get out of the Rat Race. While others, do not even want to enter the Rat Race. Some want to supplement their income, while others are looking for a way to retire. Of course, there are a lot of curious ones too. Are they all newbies? Not at all. There are a lot of newbies, but there are seasoned affiliate marketers too. Sometimes I read their bio’s and I am like “You have done it all, what else do you need?”. This is also proof that Wealthy Affiliate is for everybody. Some members had a website before joining and are very handy in customizing and setting it up. I built my first website here at Wealthy Affiliate. I have met a lot of teachers, nurses, network marketers, fashion designers, yoga instructors, guitar players, hikers, students from a range of disciplines, mechanics, engineers, writers and I could go on for hours. There is also a group that I admire the most. They can not participate in the job market due to their health. I am so glad they found Wealthy Affiliate and the community to share their experience, knowledge, and desires. The community, the members of Wealthy Affiliate are from all over the world, with different backgrounds and experiences. How to get in touch with the community. There are so many ways to get to know the people in the community. I will go through some ways I found out, but I am sure there are more ways. At the moment you make an account you will receive two messages; one from Kyle and one from Carson wishing you welcome to Wealthy Affiliate and like on Facebook they will follow you. If you signed up with someone with a website, you will receive a message from this person too. So you feel welcome from the first moment. All the other members can see on their personal WA Space (Wealthy Affiliate Space) the persons who sign up if. The WA Space is something like your Profile Page in Wealthy Affiliate. There are a lot of people, like me, who like to welcome the new members. But there are so many new members every day that I choose every day 8 new members to welcome and to follow. I go for the ones with a picture. The new members can follow me back. On top in the middle of the homepage of Wealthy Affiliate, you will see the members that sign up to become a Premium member. From there it is easy to say Hello to them and follow them. This is a great way to make new friends. You can follow the Certification Course or the Affiliate Bootcamp. The text and videos of the lessons are always followed by a discussion. Here you can post comments about the course. Sometimes one of the tasks is to put the link to your website, social profiles or your experience. Other members will react to your post and you can engage in nice conversations. Sometimes you will find someone who is giving you really good ideas or tips. You can react to posts of the community members too. There is also a list of the top helpers in the thread. If you like their advice or website you can just follow them. If you write something interesting, they will follow you too. On the homepage, there is a Live Chat. Here members socialize. Say hello, talk about the weather but this is a super cool place to ask questions. As the members are from all over the world, there is always someone online. Most of the time you will get your answers in no time. Wealthy Affiliate gives you the possibility to post within the community about things that you are experiencing in Wealthy Affiliate. These blogs appear on your profile page but also on the Activity dashboard. You can read those blogs too and engage in conversations, support or encourage someone or celebrate their success. As a Premium member, it is possible to publish a training for something you think that can help the community. Or maybe it is you that need something in more detail explained. The training of a member of the community can help you out. Probably the person who wrote the training can do a lot for you. And you can even become friends. The Site Feedback is a place where you can ask the community to give you feedback on a page or your website. To be able to do this you have to give feedback first. It is a nice way to give and take. Premium members also have the possibility to send each other private messages. Sometimes you want to ask a specific person something privately. Well, that is possible too. The community is everywhere on Wealthy Affiliate and they help you with whatever you have. You can make friends and exchange experiences and questions. But you also get inspired by accomplishment and successes of others in the community. So this is how the Wealthy Affiliate Community works. Join us for free and get the feeling of a loving, caring community like nowhere else on the web. The use of internet – Every second! Businesses are using the internet because every second a lot is happening. Any idea what and how much? Just take a look at it. Real-time!! Author MMacLeodPosted on April 12, 2018 April 12, 2018 Categories TipsLeave a comment on The use of internet – Every second!